Hi folks or should I say Pura Vida! Here is a little snippet of one of the adventures we had here. 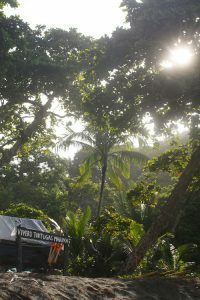 On Wednesday morning, after a nice late start we headed to the Piro station where we met with Manuel Sanchez who gave us an introduction to the four species of local sea turtles and the sea turtle conservation efforts on the Osa Peninsula. 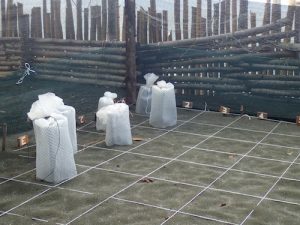 Turtle conservation is especially important because sea turtle eggs face dangers from factors such as predators, tidal changes, and especially egg poachers. Manuel explained how different turtles come to Costa Rica at different times to lay eggs. July it turns out is an ideal time for both Olive Ridley Sea Turtles and Green Sea Turtles. We returned to camp ready for our first turtle patrol! 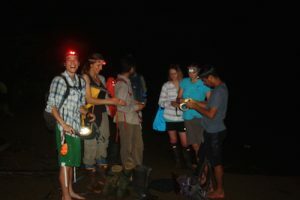 At 8 pm we joined Manuel and hiked to the Pejeperro beach for our night patrol. Manuel explained that the best way of seeing animals at night is to look for eye glow. This is the light reflected when you shine a flashlight into an eye. With this knowledge Manuel helped us spot birds, frogs and crown jewel of them all an ocelot! When we finally arrived on the beach it was honestly like a dream. The clouds had cleared up and the sky was cascaded with stars. Each one glowing with the bright illumination that you can only get without light pollution. When you took a step on the sand it would spring to life with its own vivid color, the bioluminescence complementing the light of the skies. In the background the waves crashed with perfect rhythm, a symphony of their own. It was a beautiful juxtaposition of earth, sea, and sky. We began walking down the beach. 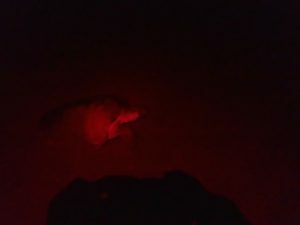 We covered our flashlights with red cellophane because white light can scare the turtles into leaving without laying eggs. Eventually we turned off our flashlights completely, the stars providing more than enough light. Finally, Manuel tells us to stop and he walks on ahead, he says he saw something. He gestures to come over. There hidden just below sand level is a 65 cm long female Olive Ridley laying her eggs. They say that when a turtle is laying eggs she enters almost a lucid dreaming state, whereby she never realizes that we have seen her. 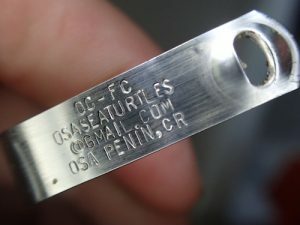 Manuel explains how he puts tags on every turtle they find to keep track of them. We watch as he gets the turtle ready but is unable to put the tag on because the tagging mechanism had a broken part. Sitting there next to the turtle I feel like I am witnessing an ancient ritual. Turtles are some of the oldest species dating back almost 125 million years. In that moment I felt so small and insignificant to the enormity of life. And the soft perishable mind which doesn’t. A big thank you to Round River for the opportunity given to these small groups of students from study abroad programs who have the chance to experience and learn by participating in awesome field trips.